it was an unknown number of years ago, we were gathered gazing at our flock of sheep here at the farm, hosting a group of our region’s apprentices, one of whom happened to also be a weaver. taking in the sight of the delightful animals that provide the wool she did her weavings with, she was enamored with the whole scene. when life sped her away from here, she loaned us her loom, she was travelling light. care for it, weave with it. 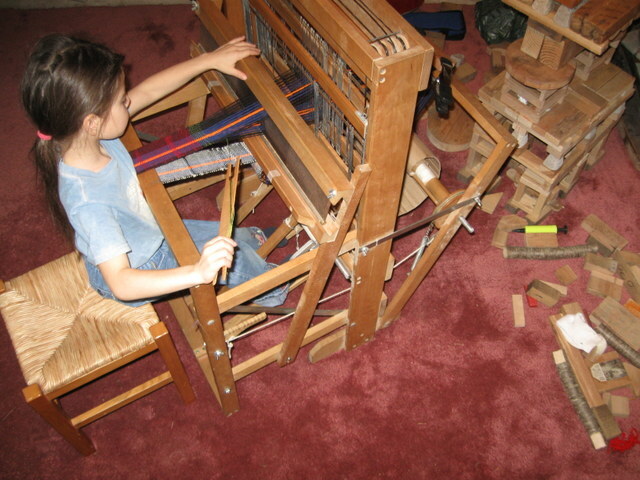 the loom was placed in the middle of our living room on that early spring day and the whole family gravitated towards it. equipped with our new vocabulary and a heap of yarn (not our own yet, we had some years to wait). 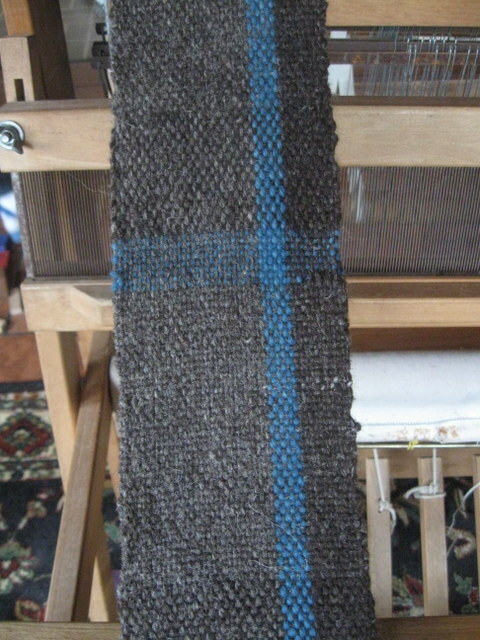 we learned of warp and weft. we identified reeds and dents and shuttles and beaters. we discovered treadles and castles and sheds. we built a warping board and made sley hooks. it was great fun. alas, the summer came and our work load increased. our lives, as they do when spring changes to summer, turned outdoors. the pink and white herringbone project that madeline and I were working on gathered dust. 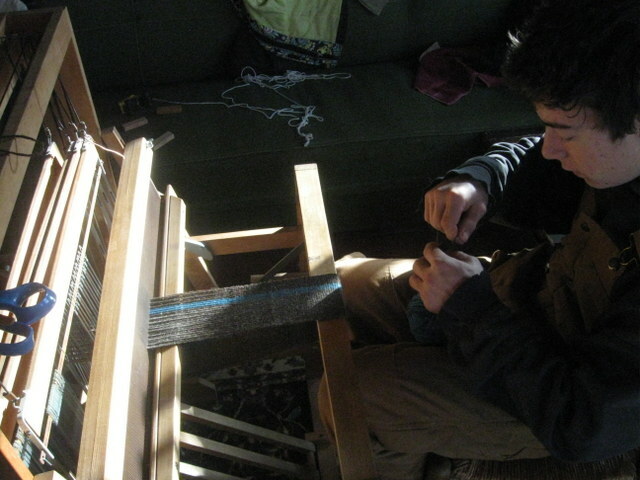 the loom moved out of our living room to the farm office and time passed. 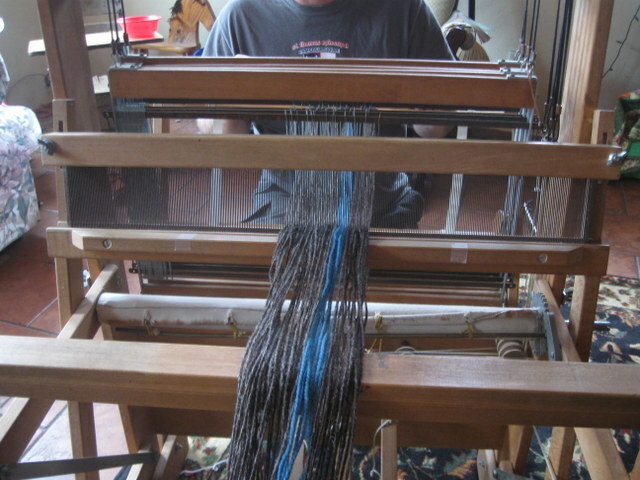 since we have had our own yarn, paul has been obsessed with weaving it. you see, the loaner loom became ours for his birthday some years back. he loves the loom and the weavings it produces. it did however take a polar vortex to swoosh that loom back into our living room. here it landed and paul (both artist and shepherd) designed a simple project using our own yarn: the brown, the grey brown, and the hand dyed indigo. we all weaved on it, we all thrilled in it and we all welcomed weaving back into our lives. that project led to another and yet another, the cold days that lie ahead offer us another opportunity to learn and enjoy each other and our indoor life. indeed it is friends, indeed it is. 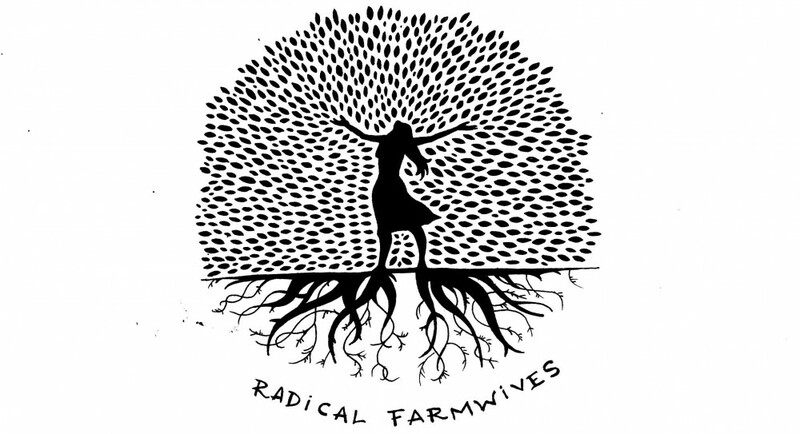 This entry was posted in robin's posts and tagged family, natural dyeing, sheep, weaving, wool by robin. Bookmark the permalink. Its fantastic that weaving has become a family affair. And yes, a lot of things are better than TV! However, most of America doesn’t realize that. oh yes, it was a funny comment to those of us that have no tv! Oh yes it is! 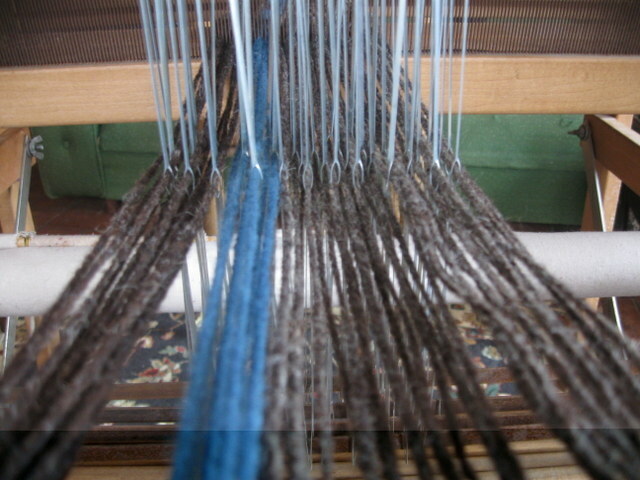 I am a weaver, and my loom is also in my living room…lovely way to spend an evening :0) m.
what kind of loom do you have? what types of projects do you weave? love love it, we really do! 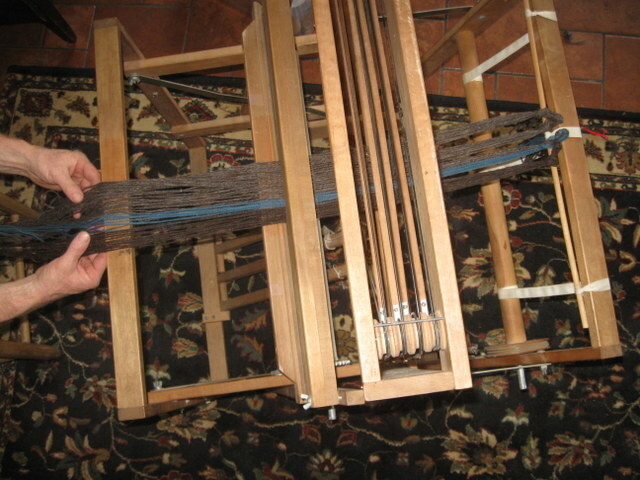 My loom is a Nilus…I have not been able to finish too many projects, but I am getting there. 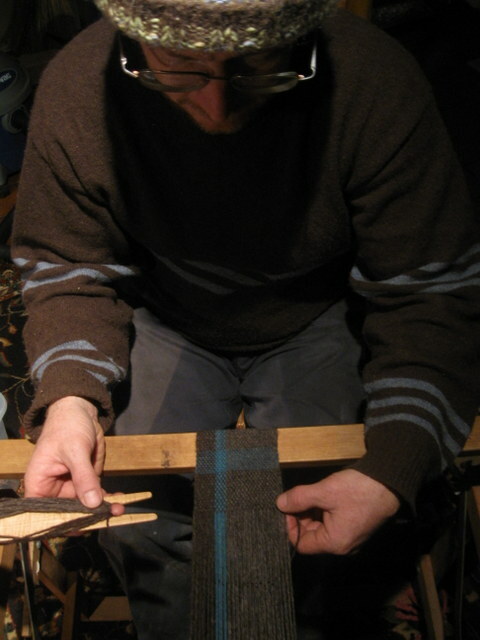 The first one I will finish will be a scarf : ) m.
It’s lovely, a beautiful journey finding the joys of weaving. peace to you all! thank you so much, a journey indeed. Beautiful! Welcome to the endlessly fascinating world of weaving.